'View of the Assar in the fortress at Cuddapah'. Engraving by Capt. Thomas Fraser, c.1812. bl.uk > Online Gallery Home	> Online exhibitions	> Asia, Pacific and Africa Collections	> 'View of the Assar in the fortress at Cuddapah'. Engraving by Capt. Thomas Fraser, c.1812. 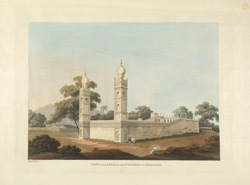 Coloured engraving by Captain Thomas Fraser, (1776-1823) of a 'View of the Assar in the fortress at Cuddapah' in Andhra Pradesh, dated c.1812.